We’ve done this a few times, and the results are spectacular! The Feds have all the nautical charts around the coast of the US available for free download at the NOAA website. The photo you see is an 8×20 foot nautical chart wallpaper from New York all the way past the Georges Banks. It’s on its way to a seaside home in Rhode Island where it will certainly be a topic of much conversation! The only difficult thing is that the government, in their wisdom, has everything in BSB file format (whatever that is). There are links on the NOAA site that send you to places where you can download a utility to convert them to jpg or png, we used BSB Reader and it works great. The charts are really high resolution, so they have the pixel density to go up to wallpaper size pretty nicely. If you don’t wnt to go to the hassle of converting the files, let us know where you want your charts and we’ll send you a jpg of what they look like. All part of the service! What a great way to put up wallpaper that becomes a topic of conversation! We did a chart of Nantucket Sound for a vacation house there a few months back, and they loved it. Maybe this is the next big thing for Custom Printed Wallpaper! This entry was posted in Custom Printed Wallpaper and tagged map wallpaper, nautical chart wallpaper. Bookmark the permalink. 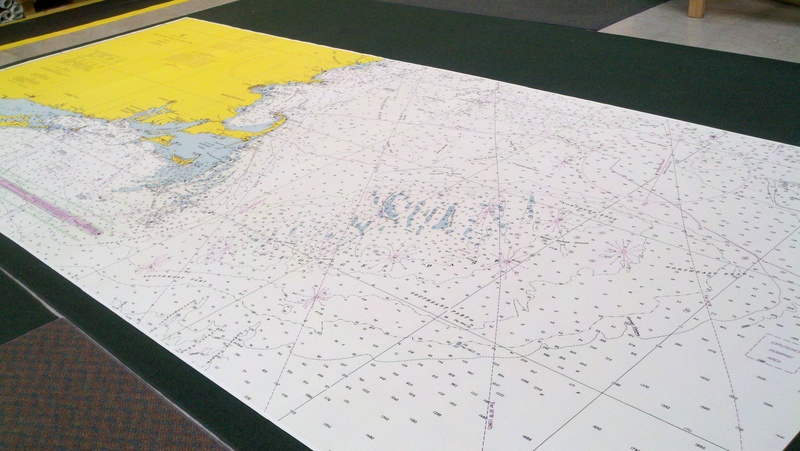 Could you do a mural size (maybe 7’X 4′) of a nautical chart that would include Martha’s Vineyard and Nantucket? How much would that cost (unframed)? I am interested in wallpaper for Pensacola/Mobile Bay Intracoastal Waterway. Could you advise me of a ball park price for an area 8’X3′? Want a 60″ wide 85″ high nautical wallpaper of the west coast of Florida from Sarasota to Key west. How much would that cost? Call us on 800-590-7850 to discuss. It’s easily done.